Is this a comment from a frustrated spouse? A child? A long-time friend? Perhaps an exasperated colleague? How many times have you heard someone say this-or said it yourself? Statistics bear out that, in general, we are not good listeners. While most of us spend about 45 percent of our waking hours listening, when someone has finished speaking we remember only about half of what we heard. Within a few hours we can recall only about 20 percent. Less than 5 percent of adults have had training in how to listen. All of this poor listening leads to misunderstandings and lost opportunities; learning to listen well, with your heart, requires practice. 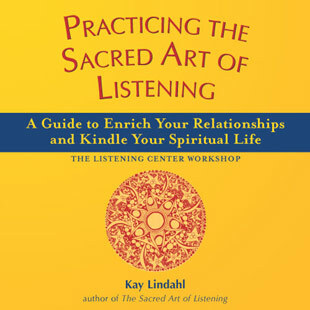 A Guide to Enrich Your Relationships and Kindle Your Spiritual Life Kay Lindahl, founder of The Listening Center, offers practical, easy-to-follow advice and exercises to enhance listening capacity in a spirit-filled way. Using examples from her own life and her international work as a teacher of listening, Lindahl explores the nature and use of silence, reflection, and divine presence as foundational qualities and shows how to apply them to everyday life. is a valuable work-shop-in-a-book that examines the varied ways people are called to deep listening. Each chapter offers concrete techniques to practice listening. Once you become aware of the many different modes of listening, you will find yourself inspired to discover how different your conversations will be when you stop just talking and start really listening. This book is designed to open the door to connection, understanding and transformation as you practice the sacred art of listening.